Tough to learn, even tougher to master! As with every week, DSiWare gets the lion's share of releases this week, although most of it is not too stellar, or at least not likely to be. WiiWare gets a long-awaited fighter plus an interesting Nintendo-published title, while VC gets another ninja action game. Toribash (1000pts - Nabi Studios) -- A very strange fighting game which is quite popular on PC, you fight as two stick figures which you have incredible control over - You can practically individually every single one of their joints. It's also one of the rare WiiWare games to feature online multiplayer! We'll review it soon. Zenquaria: Virtual Aquarium (600pts - Nintendo) -- Seemingly a mixture of My Aquarium and Endless Ocean, this allows you to dive around in an aquarium using your Mii. It's been developed by Paon, who are probably best known for the handful of recent Donkey Kong games they've made. We'll have a review soon. Shadow of the Ninja (600pts - Natsume) -- An action platformer somewhat similar to Ninja Gaiden, unfortunately in more ways that one - Just like Ninja Gaiden, we're actually getting the North American version with a different title instead, and as such have to pay 100 extra Wii Points for no good reason. You can read what we thought of the game in our Shadow of the Ninja review. SteamWorld: Tower Defense (500pts - Image & Form) -- Another tower defence title, this one features very cartoony characters and environments all set in the wild west. It was released in North America earlier this week, so we should have a review available soon. Crazy Golf (500pts - DTP Entertainment) -- A 2D golf game rather than 3D one, it's actually quite fun and worth a download. Our Crazy Golf review will tell you all you need to know. 2Puzzle It: Fantasy (500pts - Neuland Multimedia) -- Another puzzle game, although one that's not seen too often. This one actually features sliding puzzles rather than jigsaws. We'll review it soon. Hair Salon: Pocket Stylist (500pts - 505 Games) -- We don't know much about this one other than what's mentioned in the press release, but it seems to quite clearly be a game in which you get to create your own hairstyles, after which you can stick them either on the game's characters or your own photos. We'll have a review soon. 16 Shot! Shooting Watch (200pts - Hudson Soft) -- If you want to improve your button-mashing skills to be more like those of Takahashi Meijin, here's your chance. We didn't think much of it, as you can read in our 16 Shot! Shooting Watch review - For one thing, a version of the shooting watch is already included in Adventure Island: The Beginning!. A lot of choice on DSiWare as usual, but will you be going for any of it? So Toribash will not be released in germany. Why not @ Nintendo64 ? It has an USK 18 Rating, so it should not be a problem. I just thought about it. If it does well on wiiware, maybe we could get an online 3DSware version! Think about it. Toribash is graphically simple, but likely needs the rest of the processor to do the physics. Perhaps the 3DS could handle that. If I could see a dismembered robot head with paint pouring out fly "at" me, I think I would be happy. I'll pass on Toribash. Played the PC version, it's really boring. I'd recommend anyone considering Toribash who doesn't know what it's about, check out the PC version first. But a word of warning, it doesn't come with an uninstaller, so it's a pain to get rid of without leaving leftover files all over your registry. Plenty for everyone ... but not for me. Nothing for mer this week. Shadow of the Ninja is good. Glad to see it hit Europe. I just want to know if there's any significant reason to purchase Toribash on WiiWare verses just downloading it for free on PC. @Raylax usually when something has no uninstaller, just try uninstalling it through the Control Panel, then Add/Remove Programs. Any review of Zenquaria coming? I have Toribash on my PC. I like it, but I won't get the Wii version is it doesn't have the mods and no option to turn off blood. @RGVIDA And that is the problem. 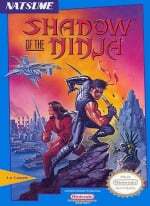 Heh, we get Blue Shadow under the name "Shadow of The Ninja"? Soooo worth the extra 100 points^^ Anyway, I already have the Blue Shadow cart, good music, fun co-op action! At least you guys get VC. Nooooooooooooo! where's Super Mario all stars I had a dream that it was gonna turn up......... I will carry on dreaming!! @Pj Come on, man/lady. Why would they release an 800 point compilation when they're already making 2100 points off the games individually? Keep dreamin'! Just keep on dreamin'.